Dr.Hari Babu Venkatesh graduated in MBBS from DR.B R Ambedkar Medical College, Bengaluru India. 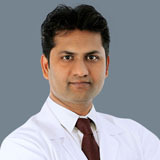 He completed his MD (Internal Medicine) from M.S Ramaiah Medical College ,Bengaluru ,India. Later he joined Vydehi Institute of Medical Sciences and research Centre, Bengaluru, India to obtain DM in cardiology. He has 12 yrs of experience. He started his professional career as senior resident at M S Ramaiah Medical College. He worked as Assistant Professor in Internal Medicine in Vydehi Medical College for 3 years and as a visiting consultant in Apollo hospital. He worked as a consultant cardiologist in Narayana Hrudayalaya - Kolar, Karnataka, post which worked as a chief consultant cardiologist in Kauvery Hospital, followed by Consultant Cardiologist in East point medical college, and Manasa Trinity Heart Hospital in Yelahanka, Karnataka. He is a state rank holder in Cardiology from the Rajiv Gandhi University in 2014. He was awarded for the 2nd best scientific paper presentation in an Asia pacific International conference India which was held in 2014 in Delhi for Echocardiography in birth defect of heart. Dr. Hari Babu can speak English, Kannada, Hindi, Telugu and Tamil.